You already know that text messaging is the preferred method of communication for today’s students. Maybe you’ve even implemented texting on your campus (in that case – kudos to you!). There’s no question it’s the simplest, most reliable solution to reach any cohort on campus. At Mongoose, clients frequently share success stories of how they’ve used Cadence to connect with students in creative ways. We’re happy to share their genius so that you can perhaps “borrow” some of these next-level texting strategies. Hi Sabrina, we just sent you an email inviting you to Admitted Students Day. The email was sent to skelly@gmail.com. Is that the best email to reach you? How it works: After sending out an important email, shoot a quick text to ensure you have the student’s current email address in your system. Why we think it’s brilliant: Emails to students often go unread, leaving staff discouraged. This approach not only prompts the student to check their email for that specific message, but it can spark a healthy text conversation. Bonus: you can also achieve cleaner data if the email address you used was not preferred. 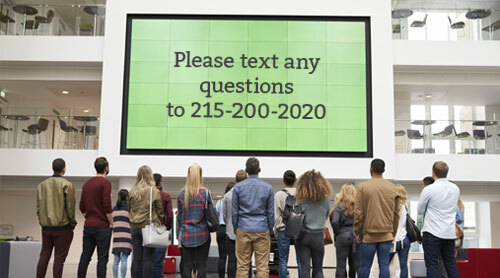 How it works: At an information session—or any type of event, really—encourage students to text in any questions they may have. Your staff can then answer directly or set up an in-person visit. Why we think it’s brilliant: Unlike their parents, students may be reluctant to raise their hands and ask questions. By offering an avenue where they feel more comfortable, you can open up dialogues that would otherwise not happen. Hi Kevin, my name is John Weber and I am a student worker in admissions at UD. Do you have questions about what it is like to be a student? If so, let me know and I will be happy to give you the inside scoop. How it works: Assign a university phone number to a student worker to provide information and answer questions from other students. Promote the number on social media and your website. Why we think it’s brilliant: Prospective students are more receptive and open if they know they’re texting with a student rather than an admissions counselor. Hi Lauren, this is Donna Davidson in Student Success. Congrats on your first week of classes. If you had to pick one emoji to describe your first week - what would it be? How it works: When reaching out to assess a student’s experience, ask a question and invite the student to answer with a single emoji. Why we think it’s brilliant: Students love emojis. They’re part of their lexicon. So this casual approach breaks the tension and can be a catalyst for an open, productive discussion. You may also find that students are more creative and candid with their responses. Hi Daniel, this is Amber from Career Services at MU. I have a few recommendations of where you can apply for internships based on what we talked about yesterday. Do you have time this afternoon to give me a call? How it works: No doubt, there are some situations and topics that may warrant a call over a text conversation. But before you pick up the phone, the best practice is to simply text the student to suggest a time for you to call. Why we think it’s brilliant: Ok, we know this sounds like no-brainer, but it’s really an underutilized approach. The reality is that students have only a handful of people who are “allowed” to call them out of the blue (parent, bff, significant other, etc). If you’re not on that list, they’re not going to answer (or they’ll feel ambushed if they do) - which makes this tactic is simple, polite, and effective. Our conclusion won’t shock you: texting is an incredibly effective way to communicate with students in a myriad of situations. Just remember – texting is only a medium. It’s how you use the medium that will help you move the needle. But as we’ve seen today, with a little ingenuity, the possibilities are endless.